After much anticipation, I can finally reveal my epic sweater. This is my healing sweater. I have failed no less than three times to make a sweater for myself. Reasons for failure include lack of skill, lack of confidence and complete stupidity. But this one is a complete success! My skills and confidence have improved so much in just the last couple of years. Making sweaters for my tiny human has helped my sweater confidence a lot, but I’ve learned a lot about reading patterns and techniques that make garment knitting easier. (I’ve also learned a lot about staying committed to the finished product.) I was able to modify this pattern just a little bit to make it fit me the way I wanted it. This will be my winter sweater. 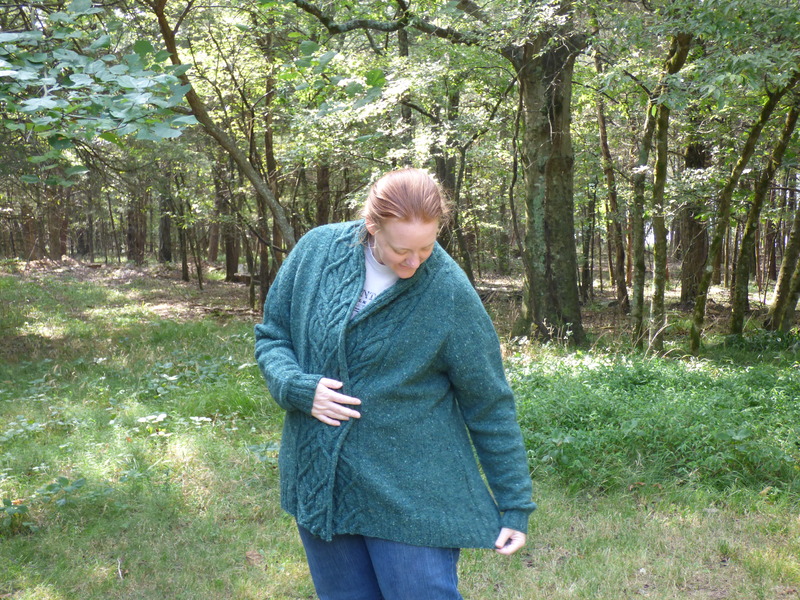 I plan to wear it over layers, so for that reason I wanted a looser, not fitted garment. I also have long arms and broad shoulders. This means that commercial sweater sleeves tend to end up being about 3/4 length on me. It’s annoying and my wrists are always cold. I’m not so into the trend of shorter length sweaters, either. I was able to make the sleeves and body long enough to my satisfaction. I might have made the sleeves just a smidge too long, but the wonderful thing about knitting it myself is… I can redo it if I want to. 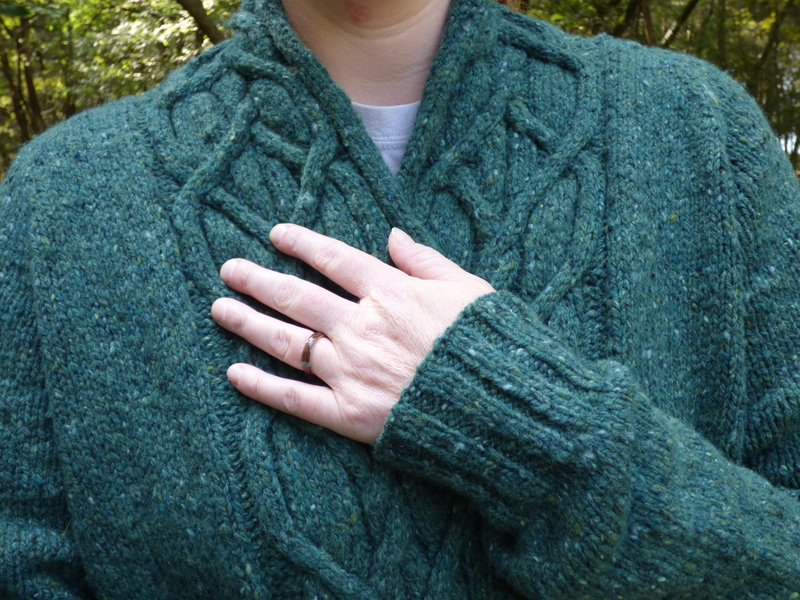 I would just undo the bind-off, rip out the cuff and a few rows, then re-knit the cuff. The construction of the sweater was interesting and fun. The designer wrote the pattern so that you knit half of the back part of the collar then you stop there, pick up stitches along the cast-on edge and knit the other half. When you get to the same point as the first half, you pick up stitches along the edge and continue on down the body. If you’re not a knitter, that is probably completely confusing, but it works and it’s fun to do. 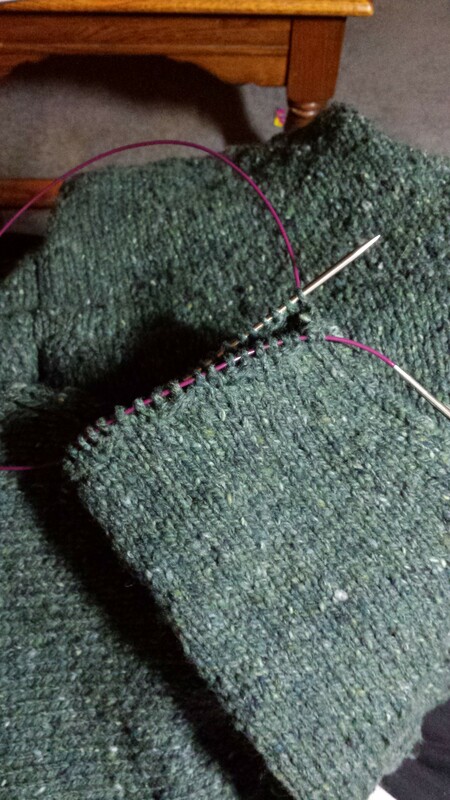 I modified the pattern at the hem to avoid having a split between the cable and the ribbing. That took some fancy needlework, but it was worth it. 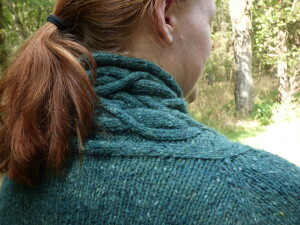 The only other modification I would make is to do a provisional cast on when beginning the collar. That way you would have live stitches to use when you started the second half and it would be seamless. As it is, the seam is pretty much invisible from the outside. I love this sweater so much. It’s warm and soft. The cables are beautiful. The construction was simple, but interesting enough to keep me interested. I will wear this for years to come. I am so happy I made this! Last week, we went on a day trip to visit family. My husband and I take turns driving, so that means I got three good hours worth of knitting time. 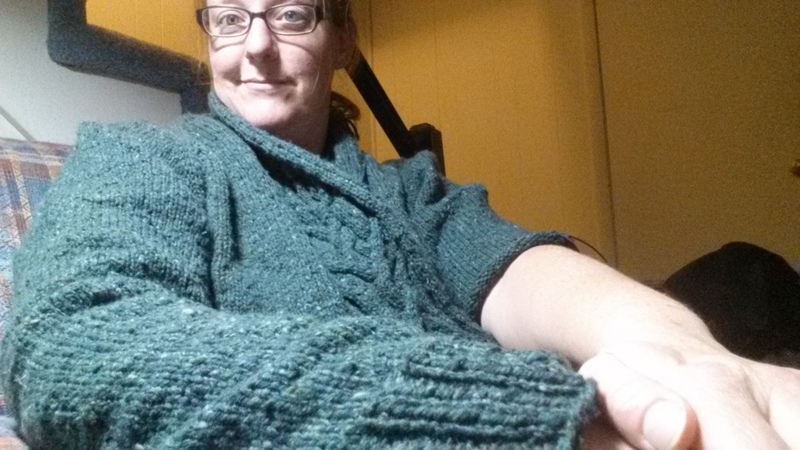 I finished the body of the sweater the night before so I was excited to be working on the sleeves. A tangled mess of needles. Tough to manage, but so worth it. The pattern calls for decreasing two stitches every three rows at the top of the sleeves. For my size, it goes down from 81 stitches to 49. It turns out this is a pretty rapid decrease. I knitted and knitted and knitted, then when I got the decreases done, I tried it on… and it was too tight around my upper arm. Now, I’ve said before that I am not a small woman. I want this sweater to be my comfortable, wear-everyday sweater. Three inches of negative ease around my upper arm just isn’t going to work. I read through the rest of the sleeve instructions and realized that the pattern is written for 3/4 length sleeves – that’s also something that I don’t want. I want full-length sleeves with some room to layer. So I had to do some math and rip out three hours’ worth of work. It’s disappointing, but I wanted to be able to wear the sweater, so it was worth it. 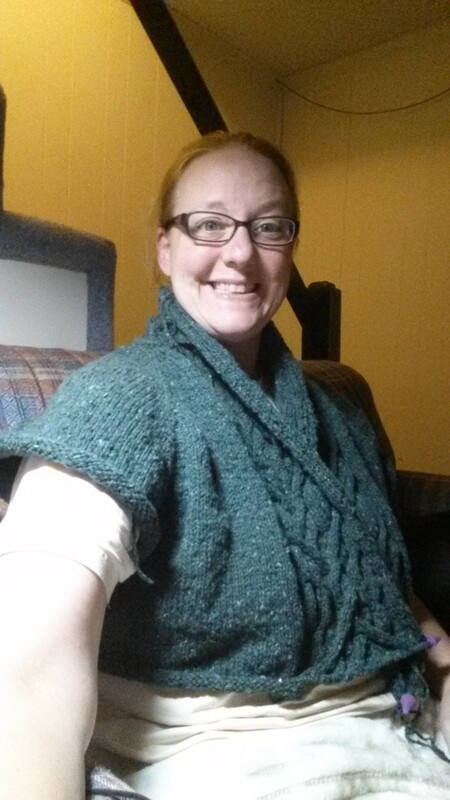 I’m still getting the same gauge (even though I felt like I was knitting tight on the sleeves – I was excited and listening to fast music, ha!) so I had to rework the design to decrease more slowly and get the length I need. My gauge was 17.5 stitches and 25 rows over 4 inches. 17.5 stitches divided by 4 inches = 4.375 stitches per inch. 25 rows divided by 4 inches = 6.25 rows per inch. The pattern was decreasing two stitches every three rows, so that works out to almost one inch decrease in circumference every inch of length. 49 stitches (this is the number of stitches you end up with after all the decreases are done) is 11.2 inches in circumference. I measured my arm a few inches above my elbow, and it was 14 inches. No wonder it was tight! I started out with 81 stitches and decreased to 49, so that’s a total of 32 stitches decreased. Every decrease row subtracted 2 stitches, so that’s a total of 16 decrease rows. The pattern states that every third row is a decrease row. 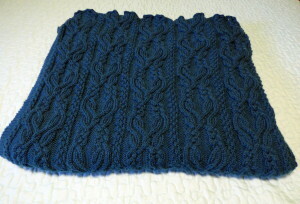 That means that as the pattern is written, it takes 48 rows to do all the decreases. 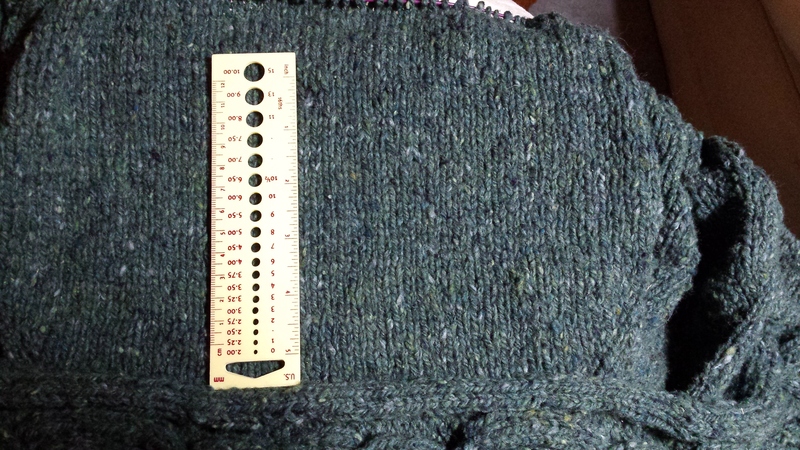 With my gauge of 6.25 rows per inch, the length of the sleeve after all the decreases are done is 7.68 inches. 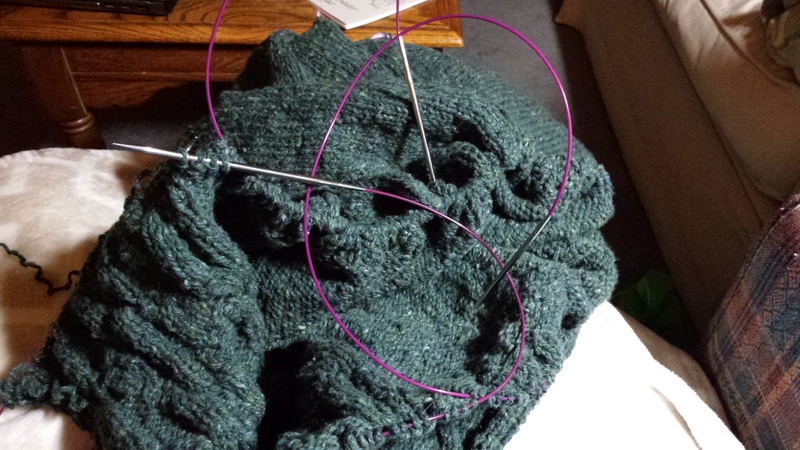 I decided I wanted the sleeve to be about 15 inches in circumference at the point where I measured. 4.375 stitches per inch times 15 inches = 65.625 stitches. I decided to round up to 67 stitches to make it even. 81 stitches down to 67 stitches is 14 stitches decreased, which is 7 decrease rows. 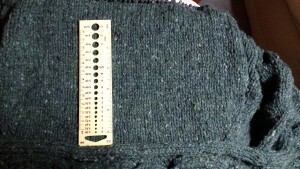 The length where I measured was about 7.5 inches down the sleeve, so decreasing once every inch will get me close enough. That means doing a decrease row every 6 rows. I continued working a decrease row every 6 rows until I got down to the 49 stitches. That got me to a sleeve length of about 15 inches. I have really long arms, so I estimated I need to work the sleeve for 22 inches. I needed to continue to decrease the sleeve down the arm to make the taper just the way I wanted it. I worked three more repeats of the decreases for a total of 19 repeats. Then I did the ribbed cuff for 3 inches. Only 17 more rows to go. 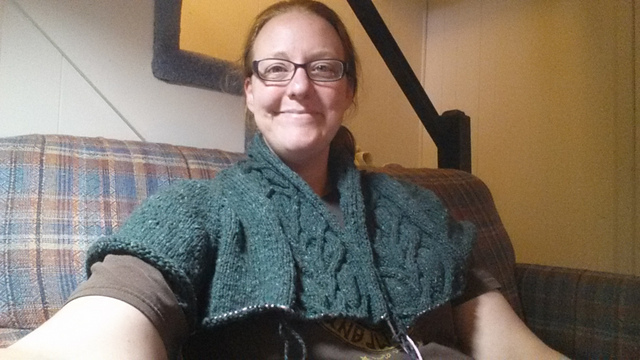 The knitting is all done, now and I’m finishing up weaving in all the ends. Then it needs a wash and a block, to make it look all pretty. THEN I can get good pictures of the final product and show it off to you. I’m so thrilled! I’m working hard on my sweater. I’m done with the body and working on the sleeves, now. I’ll have to do some math in order to get the sleeves the way I want them, so I’ll tell you about that next week (after I’ve gotten it all figured out.) In the mean time, I want to tell you about a long-term project I recently finished. I started working on it in February of 2012. I bought a book, Comfort Knitting and Crochet: Afghans and fell in love with the Aran Afghan pattern. 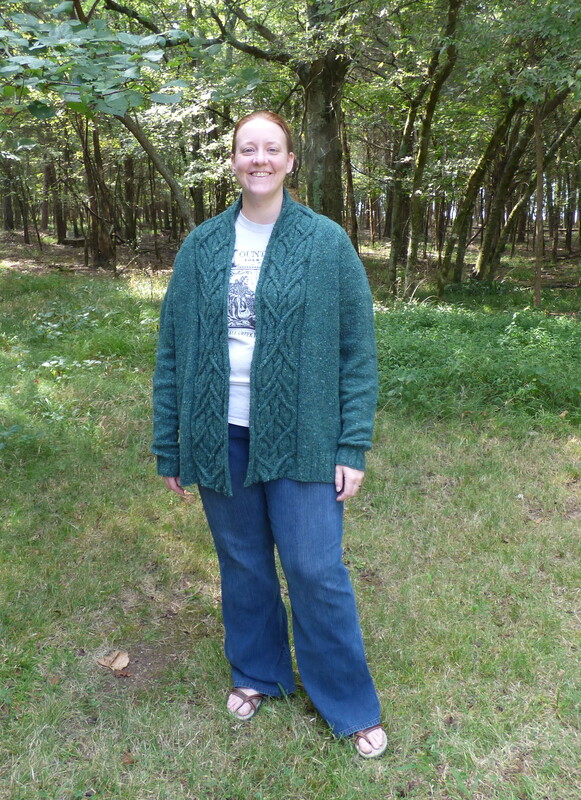 This pattern is designed by Norah Gaughan, who is also the designer of the Merle sweater. I have to pause a moment to talk about the book. Many of the patterns in that book are worthy of spending time on. I made a version of Greenway for a baby blanket when that pattern was offered for free, then I found the book and discovered many more patterns that are beautiful and unique. I just flipped through all the patterns again, and wow! This book can keep me busy for YEARS! 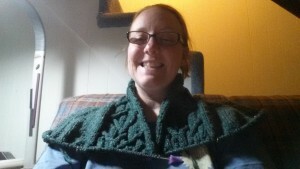 I wanted to make it out of Cascade 220 superwash. 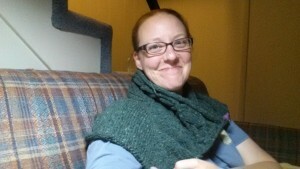 I found the right color, with help from my husband, and ordered it through my LYS. She required orders by the bag for special orders. That’s 20 balls of yarn. If I recall correctly, that’s two bags. 20 balls, 220 yards in each ball. That’s 4400 yards of yarn. 2.5 miles. 100 grams per ball means 2000 grams, 2kg, of yarn or about 4.4 pounds. I decided to stop short of 20 balls. I held back a little less than 1 ball in order to have yarn to make repairs, if needed. But, like I said, it’s a behemoth. 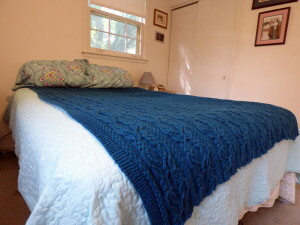 That’s no afghan, that’s a twin size blanket. Working off and on, usually during the very cold months, it has taken me more than three years. 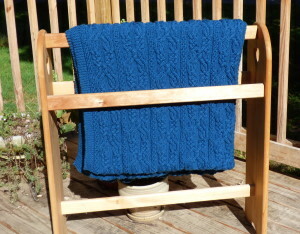 I did some of it in the spring and summer right after I bought the yarn, but it quickly grew big, heavy and hot. I worked on it the entire winter I was pregnant with Jellybean. 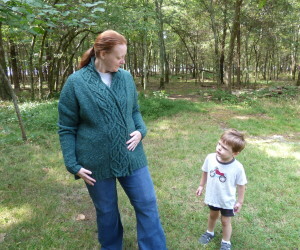 Just before he was born, it was big enough to cover my toes while I worked on it. I almost can’t believe it’s done. It’s had a permanent spot on my shelf for so long, and now that spot is bare. It’s worth it, though. Bring on the Winter!! Remember how I told you that gauge was important? 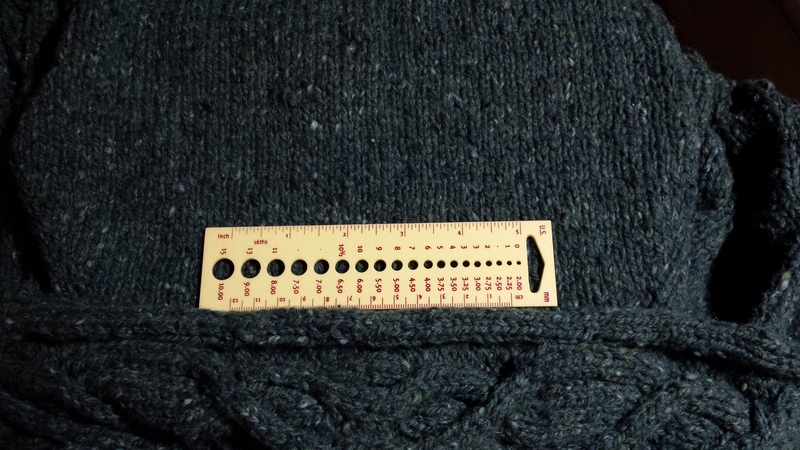 When making a garment, knitting at the correct gauge will ensure that your garment will fit the way it’s supposed to. Because of that, it’s a good idea to make sure that the gauge you got when you swatched is the gauge you’re getting when you’re actually making your project. 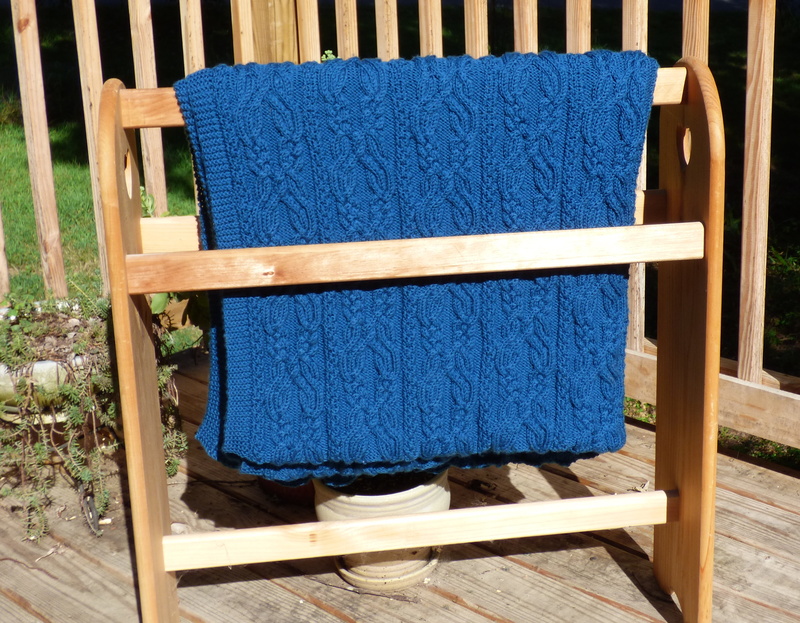 After I knitted a bit of the stockinette back, I decided to do just that. 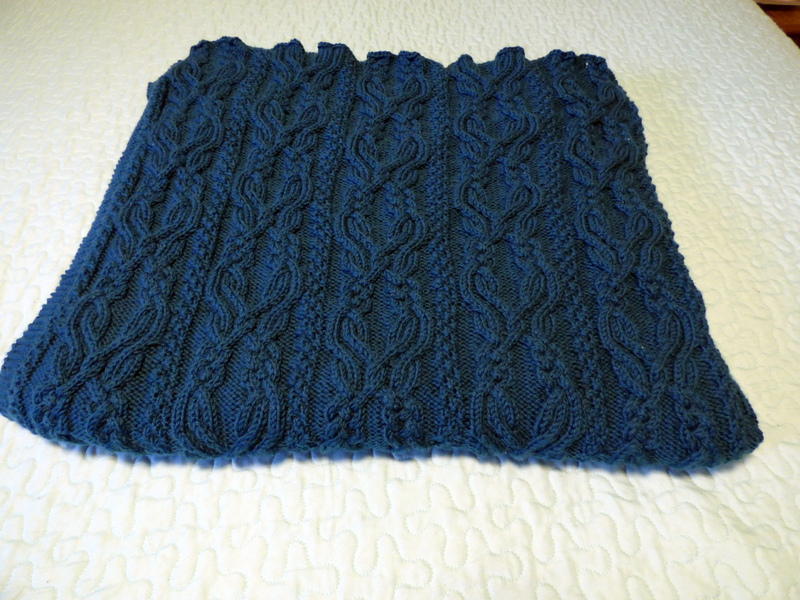 The pattern calls for 18 stitches and 25 rows over 4 inches. I’m half a stitch short and spot on for the row gauge. 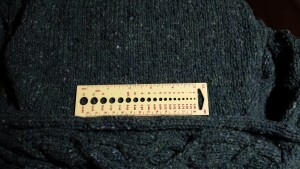 For the size I’m making, the pattern states that the back width at the bustline should be 26 inches at the stated gauge. 18 stitches per 4 inches, over 26 inches comes out to 117 stitches across the back. 117 stitches at a gauge of 17.5 stitches over 4 inches comes out to 26.74 inches. This pattern is designed with two inches of positive ease, which means that it should fit loose. That extra 3/4 of an inch won’t make much difference. 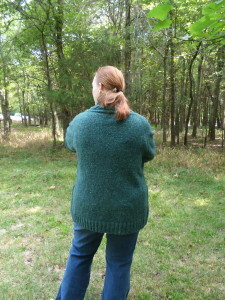 I feel pretty good that the sweater will fit me across the shoulders and back. Let’s talk for a minute about ease. Depending on the style, a sweater may be designed with positive or negative ease. Ease means that the sweater measures larger (positive ease) or smaller (negative ease) than the actual body measurements. Merle was designed with two inches of positive ease and the pattern instructions say to measure the bust and choose the size that is two inches larger than your measurement. Understanding and paying attention to the ease and the gauge will go a long way to producing a finished garment that fits well. 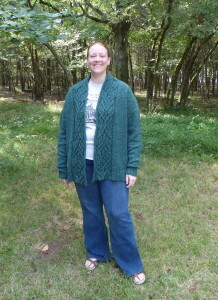 Since this sweater is knit from the top-down and all in one piece, it will be very easy to try it on as I go. In fact, I can get a rough idea of how it will fit already. You should have seen the other faces I was making. At this point, you can see that it’s a high collar sweater and the cabling is stiff right now, but it’s already softened up quite a bit. I just keep knitting and knitting. 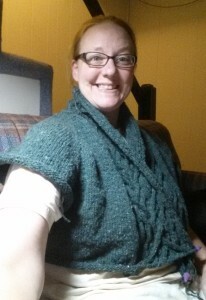 On Thursday, I got to the point that I split the sleeve stitches off and I’m working on the body. On Friday, I did the waist decreases. Saturday and Sunday, I just knitted and knitted and knitted. Happy (but sleepy) Saturday night. At this point, I’m starting to want something else to do to break up the monotony of all the stockinette. I have at least 9 more inches to knit just of the body, then I’ll make the sleeves. But I’m really afraid if I stop knitting on this, it’ll be put off again and again and it’ll be another endless WIP. I have at least one commission project I know I’ll be working on, so I’m trying really hard to get as much done as possible before I set it down. It turns out, it’s really great TV knitting, though. I can do several rows in a 45-minute tv show (we’re currently watching through Stargate: Atlantis again) so maybe I can finish it in a few weeks. P.S. – Most of my knitting happens at night, when Jellybean is (supposed to be) in bed. My in-progress photos are usually cell-phone quickies taken in my little nest. I’ll get my husband to take a great photo when it’s all finished so I can show it off in all its glory.